There’s this thing WASPs do when mentioning a food they think is really delicious. If you have WASP friends, watch closely, you’ll see. It’s an understated smacking motion made with their lips as they say the name of the food. It never becomes an full, open-mouthed smack of delight but their lips do some kind of an unconscious double-take as they mouth the words. My mother did this whenever she said “Welsh Rabbit.” “We’re having Welsh Rabbit for supper,” she’d say as she walked past me sprawled in front of the TV, and I could swear her eyes almost lit up, which was always weird because she had the habit of never showing sheer joy about anything at all, really. She called it “rabbit” in her New England accent, and I didn’t learn till much later it was also called “rarebit.” Welsh Rabbit it is to me, to this day—and there also remains something fairy tale-like to me about the dish itself—with its sheer power to make my mother anthropomorphically shift into a different being. 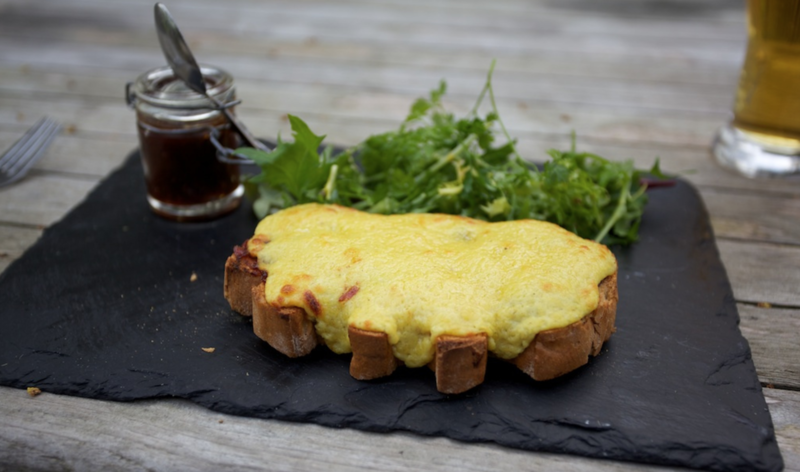 Here’s the basics about Welsh Rabbit: It’s a cheese dish. It can be made with milk or with beer. It’s hot and gooey and served over toast. It’s fast and easy to make. As a comfort food, it pretty much rates a 10/10. To me, it’s best when made with beer. Though Welsh Rabbit originally was a British import, it’s now very American. These facts of bread, cheese and beer support endless adaptation, and each adaptation can be considered an improvement. Side it with kimchi or tabouleh and it will be every bit as comforting and delicious as it is with freshly sliced tomatoes or crisp steamed green beans. The history of Welsh Rabbit as we know it begins in 18th-century Britain. The first recorded mention appeared in 1725, followed by an appearance in Hannah Glasse’s 1747 cookbook The Art of Cookery. In the following century it had made its way into the works of renowned chef Auguste Escoffier. It’s believed to have begun life as a luxurious dish served at wayside taverns, but by the time 20th-century America rolled around, it had settled into the life of home kitchens as an inexpensive dish almost any cook could successfully prepare. My mother’s recipe for Welsh Rabbit involved taking a package from the freezer then dropping the plastic bag of cheese sauce into a pot of boiling water till hot, then pouring it over the top of lots of crustless toasted white bread cut into neat triangles. After leaving home and ditching the canned and frozen food of my early life, one day while reading a cookbook I noticed a recipe for Welsh Rabbit. That recipe—in James Beard’s American Cookery—showed me how Welsh Rabbit could actually be made at home, and even better—it could be made with beer. Today, lots of good recipes can be found online from The New York Times, The Pioneer Woman, Epicurious and more. I prefer the recipes made with beer over the recipes prepared with milk because beer adds depth and sophistication to this simple dish, and it’s fun to experiment with different beers to create different taste profiles. There are other variations of Welsh Rabbit: Blushing Bunny has tomato soup added in, and Buck Rarebit is topped with a whole fried egg. The 1921 edition of Fannie Farmer’s The Boston Cooking-School Cookbook offers four variations. Welsh Rabbit doesn’t just fit neatly into the space of a cozy little supper at home – it’s on the menus of some of the most exclusive fine dining restaurants in the world, with chefs like April Bloomfield and Fergus Henderson weighing in on how fabulous it can be. From WASPs who simply can’t help themselves from almost compulsively smacking their lips when thinking about it, to top chefs around the world, it seems everybody’s on the same page as Abe Lincoln when he said (about the recipe for Welsh Rabbit, maybe—but of course about other things too). “I am a firm believer in the people. If given the truth, they can be depended upon to meet any national crisis. The great point is to bring them the real facts, and beer.” Add cheese and toast to that, please, and let’s all sit down to eat together.